By: jw35 on May 15, 2018, 4:03 p.m.
Our primary focus is on maintaining a real-time data processing platform, but we do maintain a historical record of the data we process. I'm currently working on a Web-based API that will make some of this historical data available for reuse. 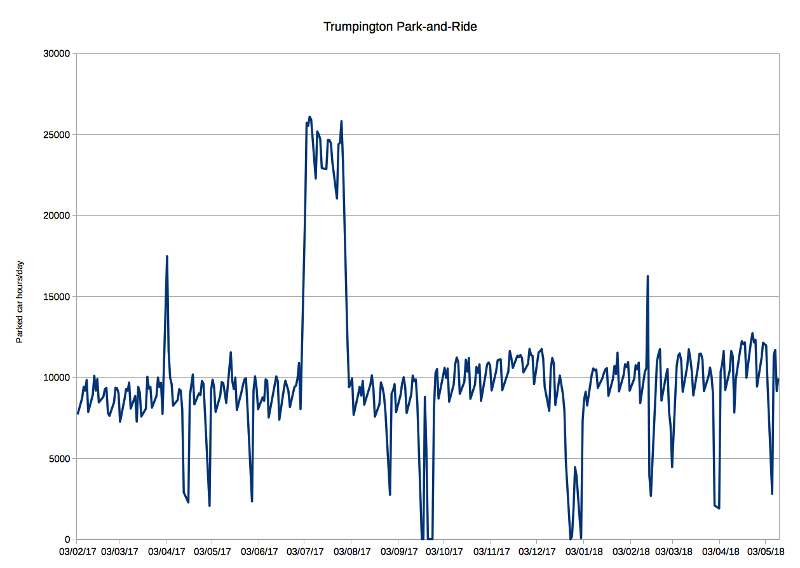 To give the current draft API a workout I've used our car park occupancy data to see if the removal of the £1/day charge for using the Park-and-Ride ar parks from 1 April this year had lead to an increase in usage. Given that it also hit capacity in the runup to last Christmas even with a charge it looks as though this Christmas is going to be busy too. The data is a bit noisy. 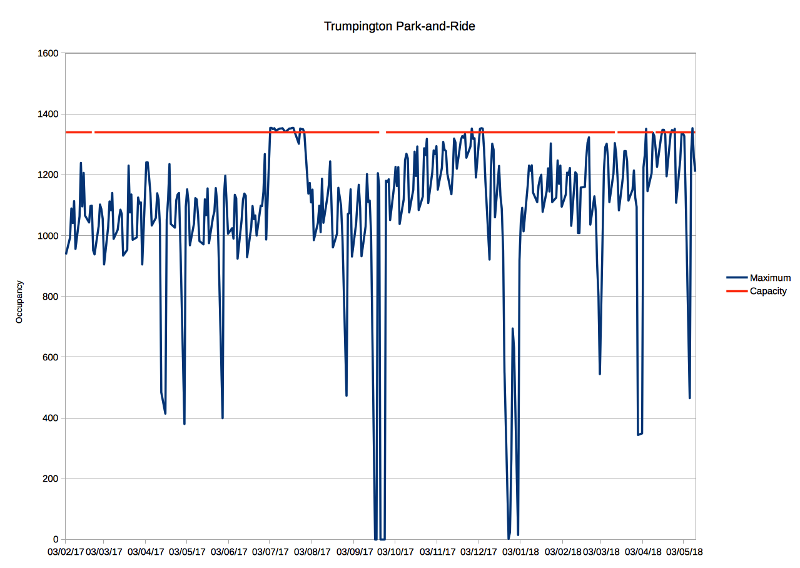 Some of the downward spikes represent Bank Holidays when the usage is obviously reduced - I've already excluded Saturdays and Sundays becasue their lower usage just adds further noise. The other spikes represent problems with the received data which is sometimes missing, sometimes sticks at one value for a long time, and sometimes only grows throughout the day (suggesting a failure of the exit sensor). 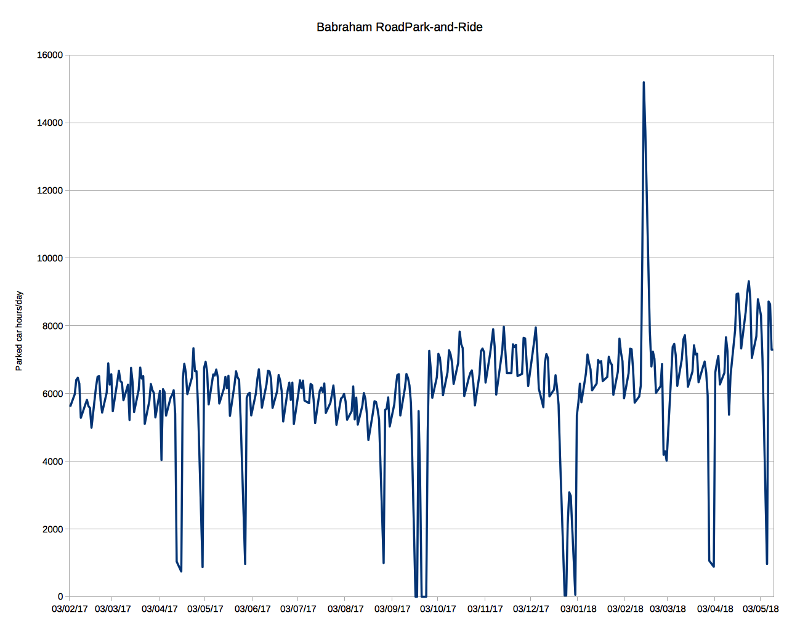 Graphs of the underlying data are available on the SmartCambridge web site (for example the current data for Babraham Road and Trumpington). The API will be available shortly. Last edited by: jw35 on May 21, 2018, 9:01 a.m., edited 1 time in total. By: edward on Aug. 3, 2018, 1:59 p.m. This kind of analysis could also apply to traffic data, though with a different target distribution curve, and would make it easier to select meaningful and accurate subpopulation samples.